MUSC1010 – WEEK 3 Adobe Audition. Mixing Waves and Phase Figure 1 - Two simple waves in phase Figure 2 - Two simple waves out of phase Figure 3 - two. 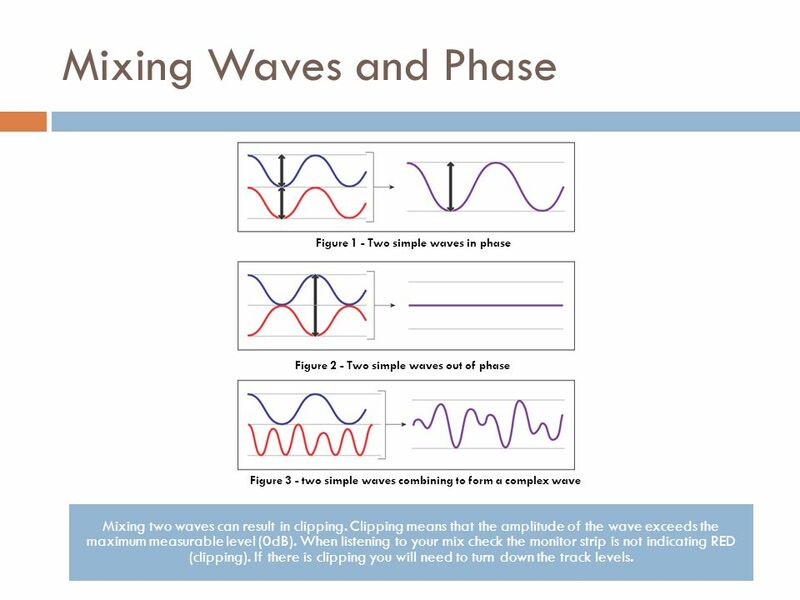 2 Mixing Waves and Phase Figure 1 - Two simple waves in phase Figure 2 - Two simple waves out of phase Figure 3 - two simple waves combining to form a complex wave Mixing two waves can result in clipping. Clipping means that the amplitude of the wave exceeds the maximum measurable level (0dB). When listening to your mix check the monitor strip is not indicating RED (clipping). If there is clipping you will need to turn down the track levels. 3 Interaction of Waves from Two Sources  Waves that are ‘out of sync’ (out of phase) can cancel each-other out. This is not an issue when using headphones because the waves don’t get a chance to interact before you hear them. 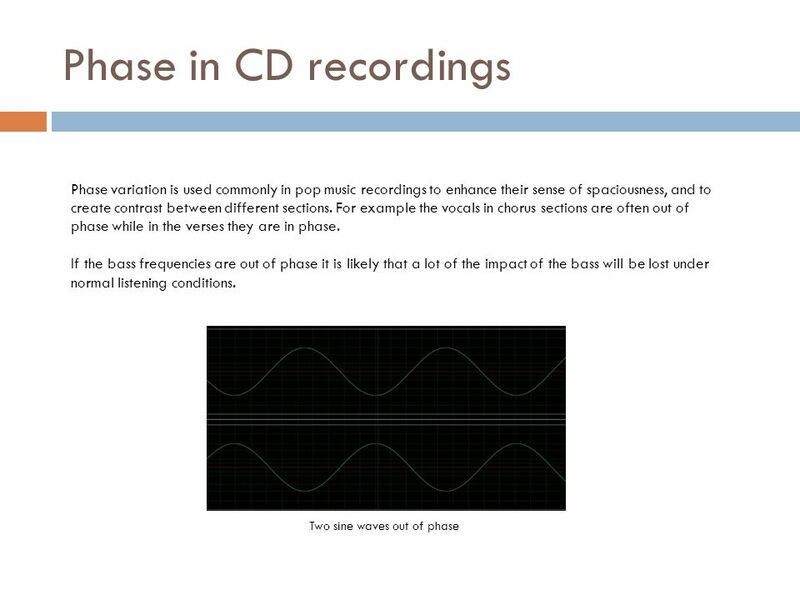 Phase considerations are important if your recording is played through speakers.  Have you noticed when attending an outdoor concert with a large sound system, that as you walk across the audience area the sound changes significantly? This is due to the interference patterns of sound waves. (Java Applets programmed by Paul Falstad)  The only place where the waves are in phase regardless of the frequency is along the line equidistant from the two sources. 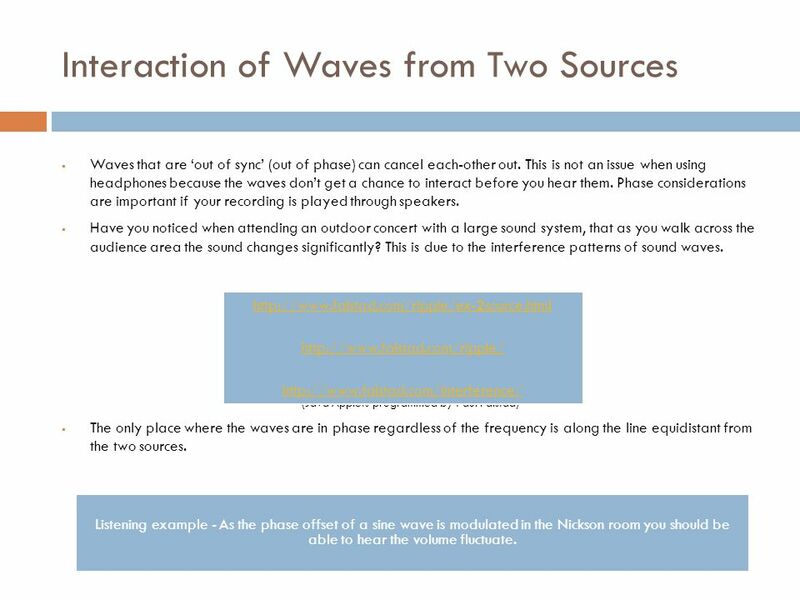 http://www.falstad.com/ripple/ex-2source.html http://www.falstad.com/ripple/ http://www.falstad.com/interference/ Listening example - As the phase offset of a sine wave is modulated in the Nickson room you should be able to hear the volume fluctuate. 5 Hard Limiting Hard limiting compresses the waveform aggressively, limiting the amplitude to a given threshold. Visually the process seems to cut off the peaks at the threshold. Most hard limiters incorporate an automatic normalisation process which then boosts the overall gain. 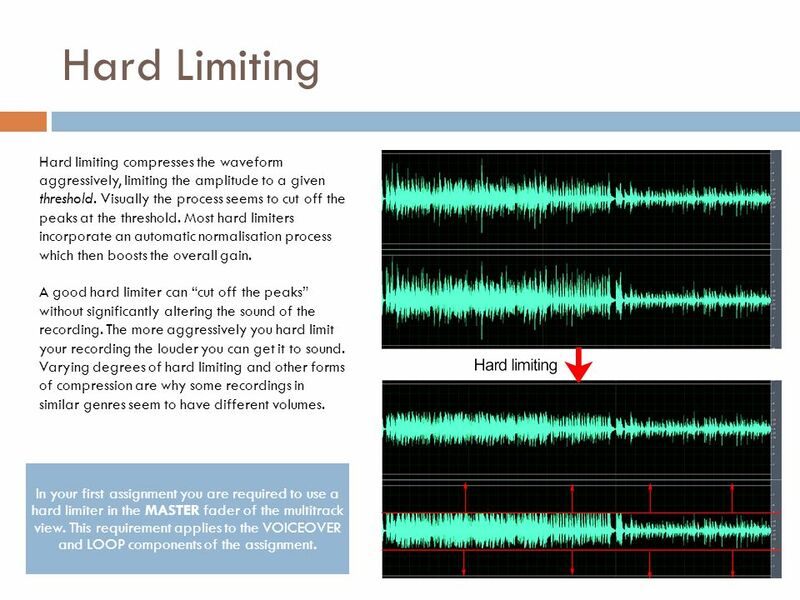 A good hard limiter can “cut off the peaks” without significantly altering the sound of the recording. The more aggressively you hard limit your recording the louder you can get it to sound. Varying degrees of hard limiting and other forms of compression are why some recordings in similar genres seem to have different volumes. In your first assignment you are required to use a hard limiter in the MASTER fader of the multitrack view. This requirement applies to the VOICEOVER and LOOP components of the assignment. 6 MULTITRACK VIEW Demonstration of a number of techniques within Adobe Audition and relating this aspect of the software to the hardware equivalents. 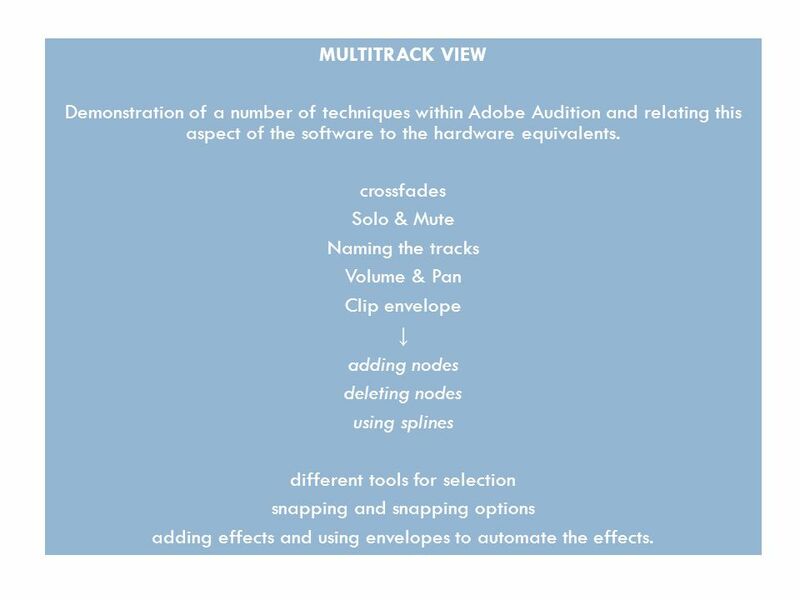 crossfades Solo & Mute Naming the tracks Volume & Pan Clip envelope ↓ adding nodes deleting nodes using splines different tools for selection snapping and snapping options adding effects and using envelopes to automate the effects. 7 MP3 MP3 is a form of audio data compression. The MP3 format has revolutionised modern music distribution by significantly reducing the amount of data required for any given length of music or sound recording. The process of converting a WAV file into an MP3 file discards portions of sound data that are considered less important to human hearing. An MP3 file with 128kbit resolution is roughly one tenth the size of its CD-quality WAV file equivalent. MP3 provides the option for different bit rates. The bit rate of an MP3 recording is measured in kibibits per second (1 kibibit is 2 10 bits). Typical rates are between 64 and 256 kibibits per second. 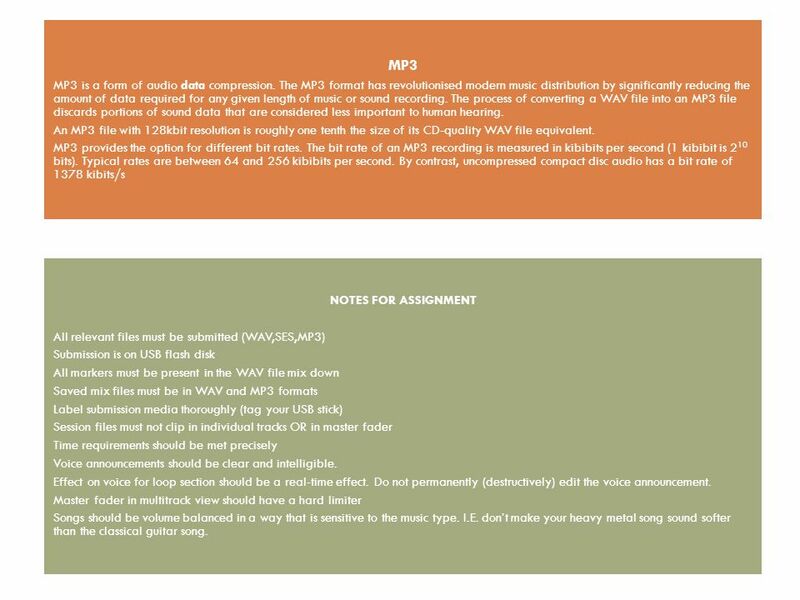 By contrast, uncompressed compact disc audio has a bit rate of 1378 kibits/s NOTES FOR ASSIGNMENT All relevant files must be submitted (WAV,SES,MP3) Submission is on USB flash disk All markers must be present in the WAV file mix down Saved mix files must be in WAV and MP3 formats Label submission media thoroughly (tag your USB stick) Session files must not clip in individual tracks OR in master fader Time requirements should be met precisely Voice announcements should be clear and intelligible. Effect on voice for loop section should be a real-time effect. Do not permanently (destructively) edit the voice announcement. Master fader in multitrack view should have a hard limiter Songs should be volume balanced in a way that is sensitive to the music type. I.E. don’t make your heavy metal song sound softer than the classical guitar song. 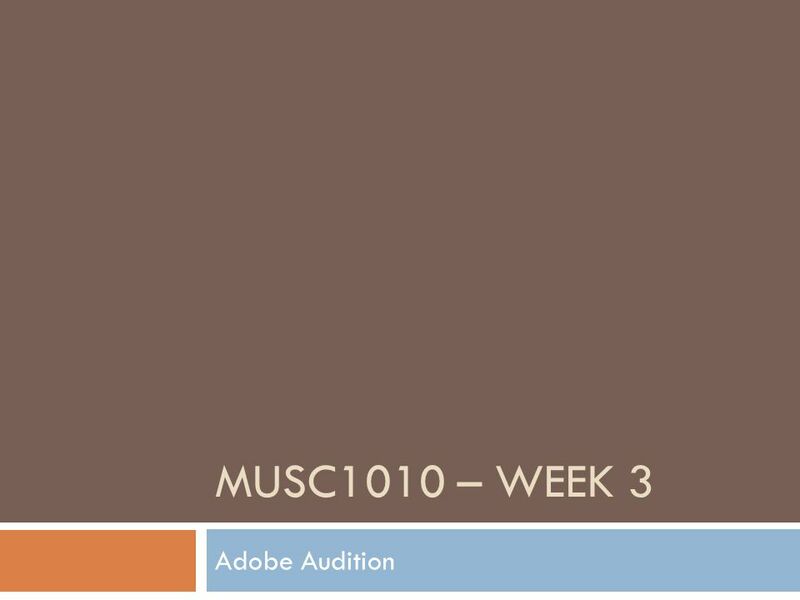 Download ppt "MUSC1010 – WEEK 3 Adobe Audition. Mixing Waves and Phase Figure 1 - Two simple waves in phase Figure 2 - Two simple waves out of phase Figure 3 - two." MUSC WEEK 2 Adobe Audition. Multitrack and Edit views  Multitrack View  Working with clips – basic manipulation  Dragging – use the right mouse. Sound Situation Formats and Foundations. Cassette Tapes Introduced by the Music Industry. Terms cont’d. The Ball And Frequency. “The Ball” Watching an unfamiliar sporting event It is difficult to try to absorb all the rules and protocols immediately. Sound in multimedia How many of you like the use of audio in The Universal Machine? What about The Universal Computer? Why or why not? Does your preference. Sound can make multimedia presentations dynamic and interesting. 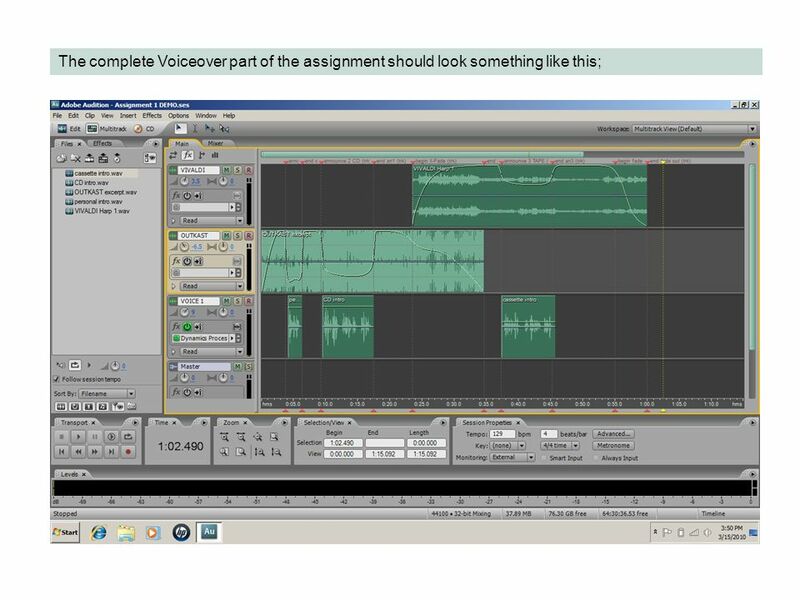 Free open source audio recording and editing software 1Using Audacity. Thursday 18 th October. Periods Music Technology A2. MUSC1010 – WEEK 9 Pro Tools Audio Techniques. ADDITIONAL SOUND SAMPLES You are invited to explore the extensive collection of free sound samples available. MUSC1010 – WEEK 8 Sound Radiation and Pro Tools Audio. Digital audio recording Kimmo Tukiainen. My background playing music since I was five first time in a studio at fourteen recording on my own for six months. Audio Communications: Sound Mr. Butler Communication Systems John Jay High School Wappingers Central School District UPDATED 11/2011.